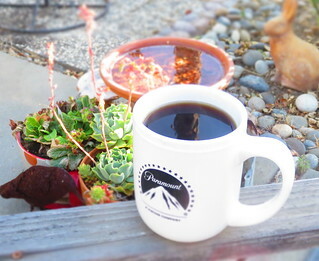 Good morning from Utah! I am up with the birds, I am so excited to be here. Can't wait to get my coffee made and and get to the sewing machine! 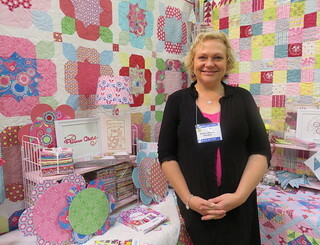 Just wanted to share my Quilt Show Quilt Market interview with Krista Hennebury. Hope you'll take a peek at Krista and I talking about her new book! I am having a little trouble with normal links working on my tablet, can't quite figure it out. Woo hoo! 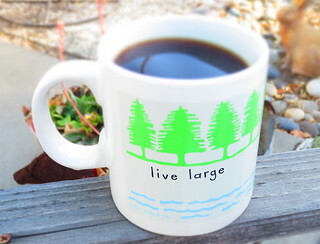 Good thing I have this ginormous Paul Bunyan size cup for coffee from Roseann as I'm headed out for week visiting Nanette this morning! 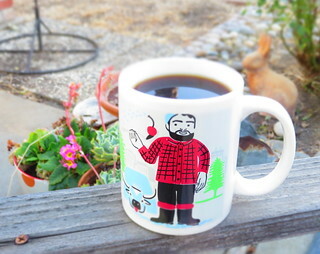 This cup is is by the same designer that my everyday sized Paul Bunyan mug from Linda. A long drive necessitates extreme measures. Anyway, I have some sewing ready to sit and sew and visit. We're also headed out for some shop hoppin! I can't wait to see what Nanette has in store. I'll be instagraming all week, so you can follow me here. And speaking of instagram, holy cow, take a look at all the Pam Kitty Garden projects with the hastag #pamkittygarden, so much fun! Hi there happy people! How was the weekend? It was wonderful weather here, not too hot, which is always nice. 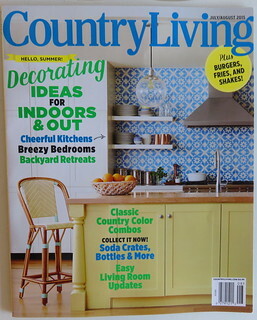 The most exciting thing was getting the July/August issue of Country Living magazine. 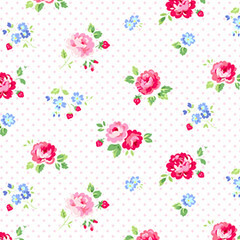 Holly and I had heard that they'd included one of the Pam Kitty Garden prints (Pam Kitty Floral LH14019B Pink) in an article as one of the 'get the look' items. It turns out Sarah Richardson has it on her list of "Classic Country Patterns for a Steal", and I couldn't be more thrilled about it. The beach cottage is so charming, I love the feeling of the home. Here's a larger swatch of the fabric! SUPER EXCITING. I guess now I'll do some panic purchasing of more yardage! This has been one of my favorites and I've used almost all of mine up. Good morning! Happy Friday peeps! How was your week? I'm all caught up with my stunt sewing now, so I can get back to working on all the in progress things around here. It's Father's Day weekend.. do you have big plans? We'll be spoiling Bret this weekend, and keeping cool with the arrival of some hotter weather. Lots of #farmgirlfriday action going on..I'm looking forward to seeing some more great blocks. Lori has been a busy Miss Bee teaching at two Farm Girl retreats, but she's still sewing up a storm.. so follow along with her on Instagram. My week is coming.. I need to get busy. Good morning! How was your weekend? 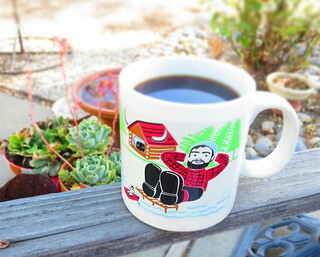 We're still weekending here, Bret has the day off! We've had some nice weekend weather so we've had fun and caught up on chores and I even got a lot of sewing done! It's Fat Quarter Shop Snapshots day again! The months with this quilt are flying by. 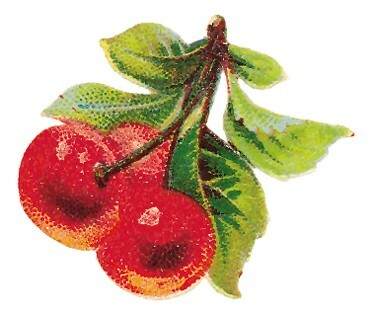 This month is Triple Scoop Sundae and it's cute with a cherry on top! I've used my Pam Kitty Garden fabrics. So by now you know the drill! You can catch the video over on the Fat Quarter Shop YouTube Quilt-Along page here! Then catch the most recent pdf over here on the Jolly Jabber! Just scroll down till you see the cute sundae!! Then download your block and get busy stitching. We're also hoping you'll donate $5 for the pattern to the St. Jude's Research Hospital, it's a great cause! I'm looking forward to seeing your blocks on Facebook and Instagram! Be sure and tag them with #fqssnapshots and #fqsfun so we can all see them! You can also join the Facebook group and post them there! Good morning and happy Friday! This morning I'm going introduce you to the latest Classic and Vintage block from Fat Quarter Shop, Delectable Mountains. This block has a rich history in American Quilting. Doesn't it make you think of the early American pioneers coming to the west over the Rockies? 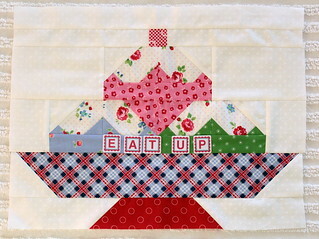 Fat Quarter Shop has a free pattern for this block, and like all of their patterns, it's clear and concise and easy to use to whip up a pile of Delectable Mountain blocks in no time. There's also a video where Kimberly shows you how to make one. If you'd like to see some examples of great old Delectable Mountain quilts, take a peek at my board on Pinterest here. Once you make one block you're going to want to make a lot more, and Fat Quarter Shop has a t downloadable pattern for a quilt for the nice price of $4.98. That's a bargain for sure! Now head over to the Jolly Jabber and see who else is making Delectable Mountain blocks and be sure and download your free pattern! Don't forget there are a lot of Classic and Vintage videos over on the Fat Quarter Shop you tube channel! Ok, have a happy weekend! WE HAD RAIN! 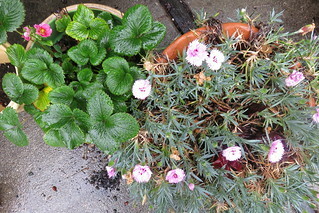 Lovely soft rain all morning and in the afternoon it rained a little more earnestly! Oh it was so divine I could hardly concentrate on anything else. 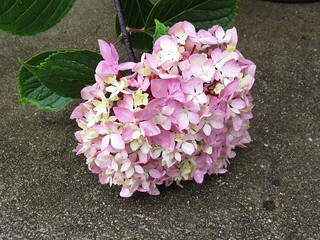 My beautiful blooming black stemmed hydrangea was heavy with all the big fat drops of rain on it! My pots all soaked up the water like sponges! What a day people, what a day! It's officially summer in spite of what the calendar says, it was in the high 90s yesterday... today should be cooler, low 90s and then the week will cool as it progresses. While I don't want to complain about the heat, it seems extra hard with the drought, the glimpses of green are so few and far between. This is a giant park at the end of our block.. sob. 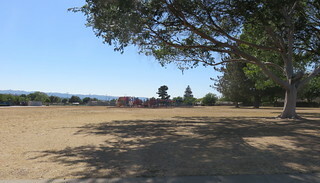 Doesn't look like a nice place for kids now, and all the lovely shade trees around the equipment are gone. OUCH that slide would really burn you! The trees along the street, not pictured here, are looking pretty stressed, and I fear for a couple of the redwood trees. I still see people doing stupid things with water.. but hopefully most of the people are following the rules. My back lawn looks like this park. Not a fun place to be on the swing anymore. BUT I DON'T WANT TO GET TOO BOGGED DOWN IN IT. My sewing room is still full of beautiful color, even though it's a hot mess. 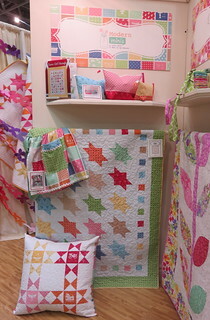 I'm working on the quilts for Holly and the new Sunrise Studio fabrics are ADORABLE. Happy Friday! How was the week? I mainly dorked around my house all week, a little of this and a little of that.. plus laundry! Coming home to a broken washer has me full of appreciation for my washer and dryer. I was taking my good fortune for granted, won't be doing that again! Today is Farm Girl Fridays.. I can't believe we're in week six already! I love seeing everyone's block on Instagram. 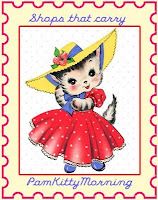 It's also the day to pick the winner of the Teach me to Applique Book! It's Elaine K. who said "Appliqué is definitely something I want to learn. 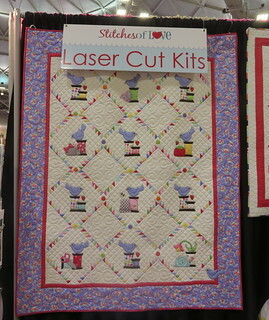 There are so many fun aspects to quilting!" Elaine, email me at rocketqltr@yahoo.com and I'll send your book to you! Big plans for the weekend? I'm going to be sewing up a storm for Holly. I'm using my backup machine, my beloved Bernina 1260 is in the shop. I'm nervous about it, apparently it could be the mother board and finding one for an old machine might be problematic. I have a nice Bernina 180, but it's just not the same. Yikes. I guess this is my problem, I fall in love with something, like my machine or my phone with a keyboard and I don't want to let that go for something new. I can learn something new I JUST DON'T WANT TO. Talk about old lady problems. Hi there! I'm still thinking about my vacation, a lot! I had a great time in Minnesota. 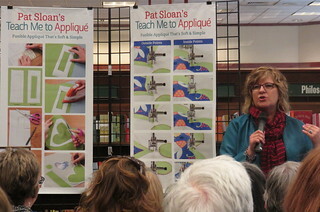 One of the fun things that Linda and I did was attend Pat Sloan's book signing at Barnes and Noble! It was a great chance to meet up with Roseann too.. so super fun time. Pat had a nice turnout, you can catch some pictures over on her blog here. 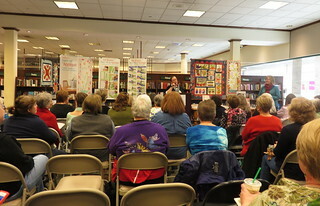 Jennifer Keltner was there to introduce Pat. Jennifer is the Publisher and Chief Visionary Officer at Martingale now. Pat is a great public speaker. Linda said she really enjoyed it even though she doesn't sew or quilt! I think that says a lot! I really like Pat's book, it's a great resource even if you never make one project! I picked up a signed copy of Pat's book at the event, and if you'd like a chance to win leave me a comment ! I'll pick a winner at the end of the week! Good morning friends! Seems like forever since we've met here for coffee! 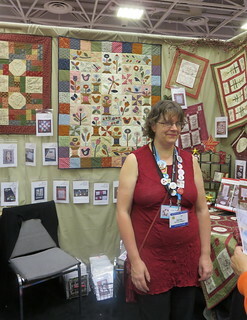 I just went through my photos from Quilt Market and thought I'd share some with you. It's just a small sampling, you can find tons online, you might even already be tired of looking at them at this point. I saw a lot online myself, and hope that I've captured some that you didn't see. First off is my friend Sherri and her daughter Chelsi.. I'm sure by now you've seen their cute new line of fabric Bright Sun. 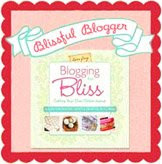 I've followed along on Sherri's blog for many years and am so happy for her. 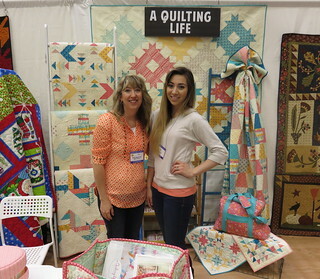 If you click over she has several posts about quilt market and a lot of great photos. 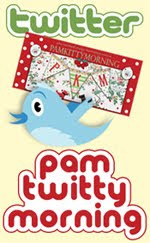 One of the most exciting things for me to see is a quilt made up in Pam Kitty fabrics. 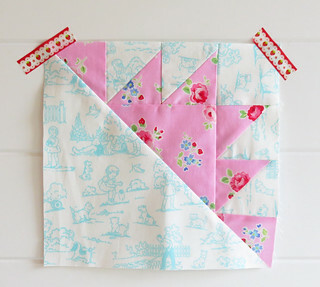 This cute Spoolie Bird quilt by the girls at Stitches of Love is made using Pam Kitty Garden fabrics. My favorite part of this is the fact that you can get laser cut kits, no tracing, and no cutting, it's all done for you. Just turn on your iron and get busy! Here's a corner of the Under a Garden Moon booth. I particularly love the Tessie pattern, at the center of the photo laid out under the book. I have it in my pile of things I'd like to do. Amy has a lot of really delightful patterns, you should check it out. Here's Gudrun's booth! 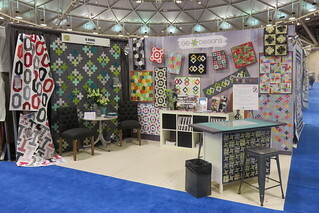 I love the quilts she displayed, my favorite being that Strip Plus pattern, featured prominently on the left side of the booth. Here's my favorite from the Anka's Treasure's booth. I have admired Heather's work for a long time, her designs and fabric selections are so appealing. This quilt on the cover of her book Angles with Ease 2 is great, and it has that 'make me now' quality that makes me want to whip out some fabrics, get my cutter and get busy. Sherri who owns This and That Patterns had a lot of great patterns. 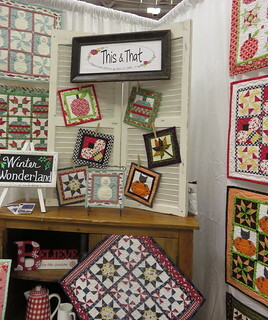 This is just a little piece of her cute booth that featured some of her wonderful new patterns in her book Winter Wonderland just out in May. 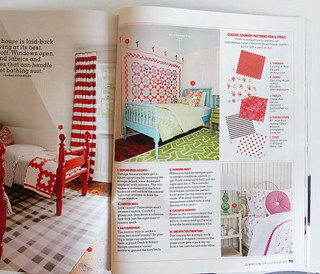 It was exciting to see a bunch of Pam Kitty Picnic featured in her quilts! Here's my friend Celine in her Perkins Dry Goods booth. Celine designs great traditional patterns and she has two tools, the Corner Cutter and the Perfect Piecing Seam Guide. Check her blog here to see her new patterns for spring. Terry Atkinson of Atkinson Designs had a great trailer in her booth. 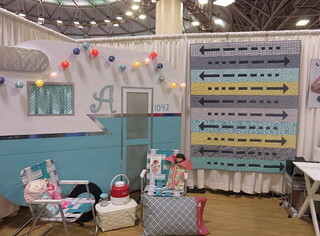 She and her husband have recently bought a reproduction Shasta trailer inspiring her to design some cute new patterns, including Wanderlust show here in her booth. I think Terry has the best instructions around. I'm sure you all know Cindy from Taylor Made Designs! 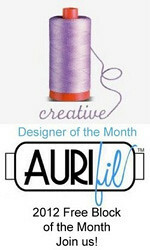 She's been in the business designing clothes, dolls, purses and quilts for a long time! I have a nice collection of her books and patterns. Her daughter Elizabeth joined her again in the booth, she's so fun. 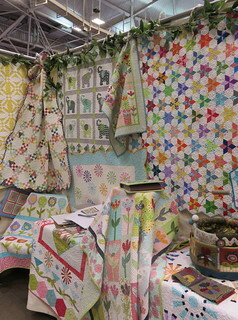 It's not market without a trip past the Riley Blake booth to see Lori's display! I don't even know how Lori manages to get it all done! 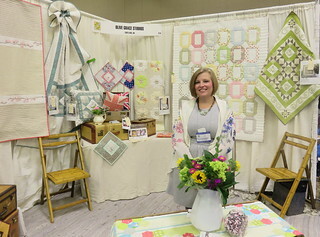 Another person who's work I admire is Allison from Cluck Cluck Sew. 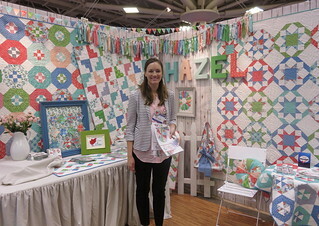 Her new line, Hazel, is fresh and fun, and all her new projects are delightful. You can't help but feel happy looking at them. I am always thrilled to see Rosalie! Here she is in front of her display at the Ella Blue booth. I love her cheerful fabrics.. we like the same types of prints and colors! I had a wonderful chat with her and Jodie on Sunday afternoon when things slowed down. Its so great to see people at market you almost forget it's work! JODIE! Seriously yours truly can be such a nut ball. 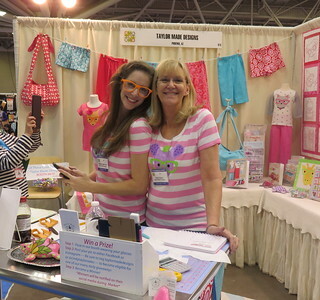 I am cruising her booth, chatting it up, talking about her pal Ann, admiring all her wonderful projects and it takes like TWO DAYS to realize Jodie and JODIE RIC RAC are the same person. 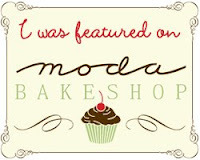 I fight a losing battle with actual names and social media names or blog names. And seriously how cute is her line Backyard Circus? It was great meeting up in real life with her. 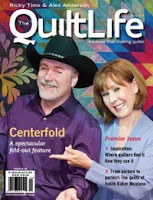 Of course you can't think of Australian quilters without thinking of Gail Pan. What fun she is. 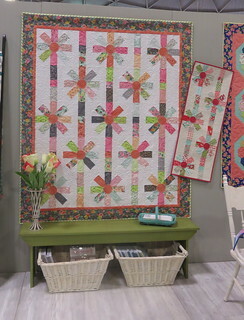 I am in love with that cute sewing themed little quilt behind her in the photo, Sunshine and Butterflies. New to me, but not new is Kori from Olive Grace Studios. 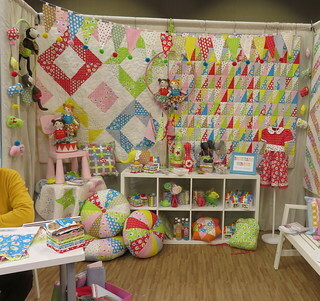 I just loved her booth and all her pretty projects. Her soft colors were so pleasing to look at, and I liked her combination of piecing and embroidery. One of the exciting things I got to do was walk around with John from the Quilt Show, and talk to some people about their projects. My first interview is available here. 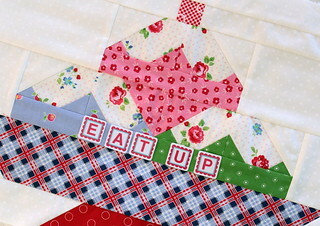 My segment is about the vintage quilts.. but there are more to come. I spoke with some of your favorite people.. so I'll keep you posted. 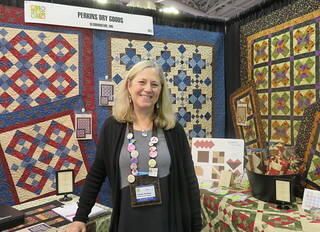 I loved talking to Carolyn Springer about her collection of vintage quilts! There are other interviews with Alex posted as well, it's a fun glimpse into what's up!